Magnetic nulls are points in the magnetic field where the field strength goes exactly to zero. Reconnection at three dimensional (3D) magnetic null points plays a key role in many of the explosive events that occur during active times of the solar cycle (e.g. , , ). Observations of the solar atmosphere show it to be highly dynamic with perturbations of the magnetic field often lacking any strong symmetry. Despite this, studies so far of 3D null point reconnection have focused on the very idealised case of symmetric driving. In our recent work we investigated the consequences of breaking this symmetry. This nugget will describe how in practice nulls naturally move around and what effect this has on the reconnection process. Figure 1: A 3D null point described by B=(x,y,-2z). The blue field lines are the spine lines and the red ones are a selection within the fan plane. The black arrows indicate how we perturb it. Figure (1) shows an example of a 3D null. The magnetic field near the null is characterised by two main structures. The spine lines (shown in blue): two field lines that directly approach the null and the fan plane (shown in red): a surface of field lines emanating out from the null. 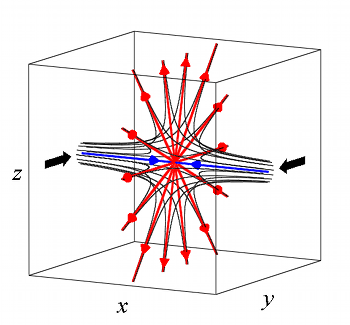 Due to this more complex structure the reconnection scenarios that occur at 3D nulls are rather more varied than their 2D cousins, with twisted as well as sheared modes (for a review see ). We focus here on the Spine-Fan mode. This is the 3D analogue of X-point collapse in 2D and occurs when the spine line and fan plane of the null locally collapse creating a current sheet at an angle to both. We consider asymmetric perturbations and use several combinations of transient pulses (initiated at the spine foot points, Figure (1)) to simulate buffeting motions and observe the dynamics using a 3D resistive Magnetohydrodynamic (MHD) code. Figure 2: Electric current modulus and plasma velocity in the plane containing the spine and fan (perpendicular to the perurbation). A steepening of the wave front as it reaches the null (due to the reduction in Alfvén speed ). An asymmetric collapse of the spine on to the fan as the pulse reaches it. Plasma flows back and forth across the spine and the fan plane during the initial collapse and subsequent relaxation. A shift in position of the null point itself to some maximum displacement before returning to its initial position. The most striking feature compared with symmetric studies is this sudden shift in null point position. Is this something that might be observable? To answer this we need to understand how the movement occurs. Figure 3: Top panels: Arrows showing the main forces in the same plane as Figure (2) as the null is moving. + shows the null's position and the black lines are a selection of field lines. Bottom left: the net force sends the null toward the top left of the figure. Bottom right: the 3D structure of the magnetic field. As seen in the bottom left panel of Figure (3) the null point displaces due to an uneven net force (toward the top left in the figure). This is in contrast to a symmetric case where the net force is equal and opposite and hence the null point remains stationary. However, both cases involve spine-fan collapse , which is linked to the resistivity or non-idealness of the region. At lower resistivities the spine and fan can collapse closer together as much higher magnetic field gradients are allowable before diffusion effects become important. In the solar corona, where the resistivity is incredibly small, the spine-fan collapse will be significantly greater compared to those achievable in simulations. We find that reducing resistivity in our simulations creates an exponential increase in how far the null is shifted. Thus in the corona null points will move very rapidly indeed! With continued buffeting the null is rapidly rattled around by the changing flows. With the solar corona believed to have complex magnetic fields, large scale asymmetric plasma flows around “singular” magnetic field locations (as studied here) might be a useful diagnostic for observing displacements in 3D null points. Figure 4: Left: reconnection rate throughout several runs. Black: symmetric pulses, red: 2nd pulse offset by 0.9, blue: offset by 1.8, green: one pulse. Right: peak reconnection rates for two symmetric pulses at different driving velocities (diamonds & squares) and single pulses with the same driving strengths (green triangles & asterisks). Reconnection rate is an important aspect of any reconnection model which quantifies whether it is a good mechanism for energy release or not. 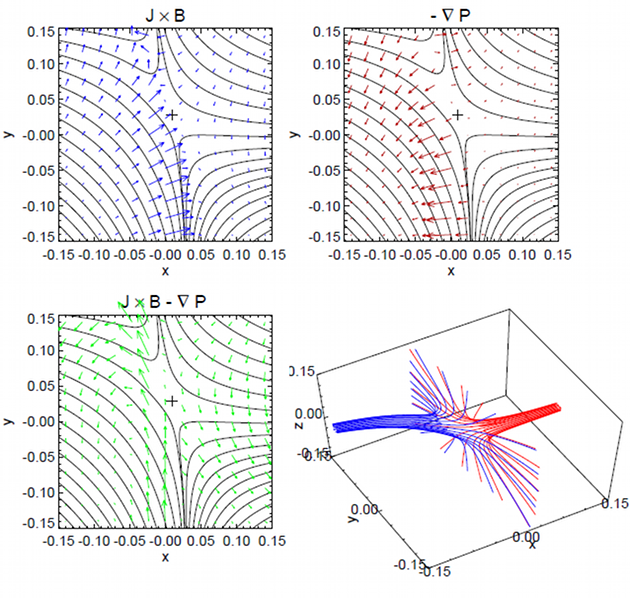 In the current model the reconnection rate measures the rate magnetic flux is reconnected through the fan plane. Considering the extra complexity here with the null moving around what can we say about it? Computing reconnection rate for such a dynamic system is not an easy task. One thing is for sure; the timing of when the pulses arrive at the null plays a crucial role in how fast magnetic field is reconnected (Figure (4), left panel). What is even more fascinating is that how reconnection rate scales weakly against resistivity (the crucial measure of a reconnection model’s “speed”) and how it is independent of the particular buffeting scenario (each fitted line has the same gradient in Figure (4), right panel). This allows the whole transiently driven reconnection process to be quantified by one particular scaling, found to be a power law. Thus, transient motions which buffet the null are deemed to give “fast” reconnection and therefore this scenario is a good candidate for continual energy release. We have shown that in astrophysical plasmas 3D null points will be continuously on the move through an asymmetric response to buffeting motions. In fact, in the solar atmosphere this movement could be quite significant given the right conditions. If such motions can be observed, they could provide evidence of wave interaction with 3D magnetic nulls. In terms of the reconnection process at such buffeted nulls we find that transient disturbances are a good candidate for energy release but that the timing of the pulses plays a crucial role. Thus a good temporal/spatial knowledge of the driving flows is essential for an accurate interpretation of the reconnection scenario. A fuller description of the process discussed herein and additional investigations into the longer term behaviour and the importance of driving scale length can be found in . Details of the code can be found in .